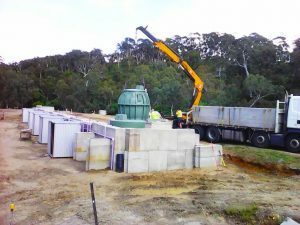 Arris has completed construction work on a compliance testing facility for the new Australian Standard for on-site domestic wastewater treatment units (AS 1546.3:2017 STS), located at the Hahndorf wastewater treatment plant in South Australia. We are now undergoing final stage testing and calibrations and have also taken delivery of the first few Secondary Treatment Systems (STS) units. With these units now installed and ready for commissioning in preparation for testing early in the new year. 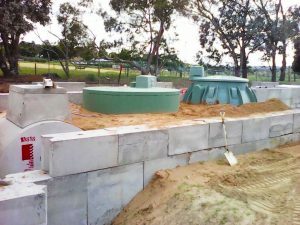 With a nominal depth of 2.1 m, the bunkered bay allows STS systems to be installed and backfilled with sand to simulate fully underground, in situ operating conditions. There is good access from the adjacent lagoon causeway for easy installation and removal of STS units via a flatbed crane truck. Arris can coordinate the installation using local transport contacts as needed. Manufacturers of all existing and new STS are required to test and accredit their systems against the Australian Standards in order to sell them in South Australia. Secondary Treatment Systems (STS) include all aerated wastewater systems, reed beds and aerated sand filters. SA Health guidelines are available here. Further information about the new Arris compliance testing facility is available here.